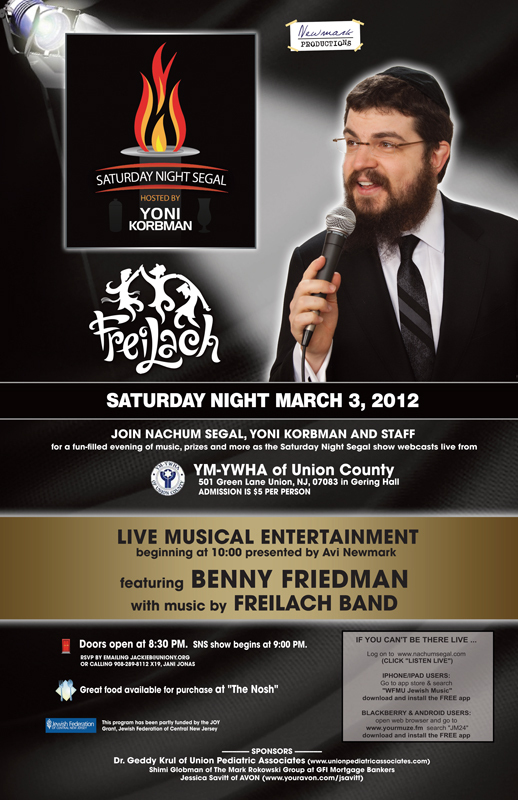 Join Nachum Segal, Yoni Korbman and staff for a fun-filled evening of music, prizes and more as the Saturday Night Segal show webcasts live from YM-YWHA of Union County, 501 Green Lane Union, NJ, 07083 in Gehring Hall. Admission is $5 per person. Featuring Benny Friedman with music by Freilach BAND. Doors open at 8:30 PM. SNS show begins at 9:00 PM. Great food available for purchase at “The Nosh”!